A solution through a simple USB WiFi stick. Smart Industry: In the early days of development, what was the greatest obstacle you experienced? Marie-Pierre: There have been plenty of smaller, interesting challenges. One challenge was figuring out how to present information in a meaningful way so clients can take it and make operational-optimization decisions. We always have a lot of interaction with clients and our internal clients in order to get to the right visual. We are still working at it. Another challenge that comes to mind is that, early on, we decided to partner with GE to develop our solutions. It was challenging to describe to them our data, equations, personas, the KPIs needed to provide our clients with direct outcomes on productivity improvement and cost reduction. We learned a lot from that exercise. For our small-business unit—the IoT for our meters—a great obstacle was finding a solution through a simple USB WiFi stick with simple instruction for small-business personnel to connect meters. Smart Industry: How did you overcome these challenges? Marie-Pierre: A lot of workshop and usability design is required. You have to bring everyone together—service, sales, clients, R&D—to work together on data representation. Assigning a full-time product manager (me) was key. Smart Industry: How have Pitney Bowes’ customer relationships evolved during your tenure? Marie-Pierre: We are finally seeing great business outcomes. With our new Clarity service model, we monitor client systems to see trends, patterns among machines, operator/shift performance, etc. In one instance our service was able to see through recurring high-material defects at a machine sealer and diagnose to replace the rollers, resulting in a monthly material savings of about $3,000 and an average of one hour of labor time. The clients gained additional runtime on their machines. In another instance we saved our client 35 runtime hours per month by identifying a few operators that needed additional training just by monitoring idle and setup time. 35 hours of additional runtime each month for a client who makes, on average, 12cents per mailpiece can be up to $75,000 additional revenue. We're thinking about your digital transformation in 2018...are you? 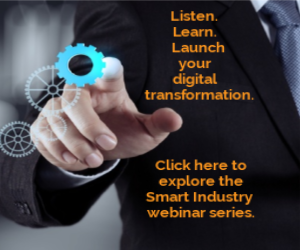 Learn about the 2018 Smart Industry Conference here.